After a great interview on Valentine’s Day with probably the best blues Americana musician alive, it was my pleasure to see him perform at the Boulder Theater. As I approached the theater, I noticed that there were a lot of people looking for extra tickets. I should not have been surprised, but the show was very sold out. It may have been attributed to the fact that there were seats in the front that were reserved and the entire balcony was VIP, but the GA section was packed. Overall, it was probably the shortest concert that I have ever attended ending at 9:40pm. But, that does not indicate the quality of the performance. 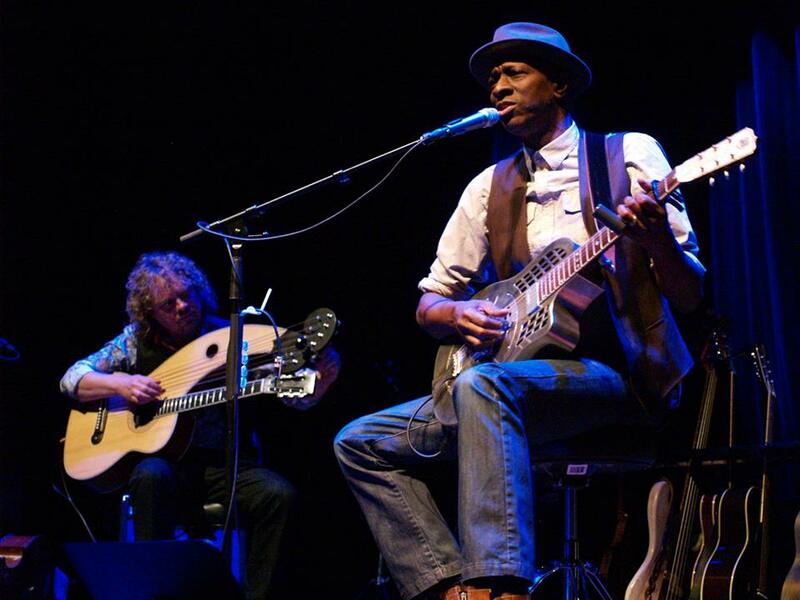 Keb’ Mo’ is a modern day throw back to a time where people played their guitars and banjos on their front porches while the dusty winds brought tumble weeds bouncing across the crossroads. His outfit reminded me of Robert Johnson’s time period. 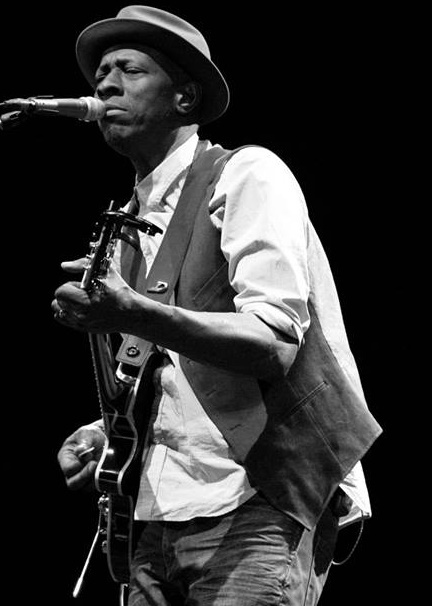 After all, Keb’ played Robert Johnson in the documentary about his life. He is not just a throwback though. He incorporates a modern Americana sound into his instrumentation, which helps to tell all of his stories. Many of the songs played are off of his new album coming out on April 22nd appropriately entitled, Blues Americana. After the opener, he played “Rita” from Suitcase, which the crowd laughed and swayed along with. Then, “That’s Not Love” off of Just Like You, provided the crowd with a great mix of Keb’s diverse collection. As I was kneeling in the front taking pictures, he started into “Shave Yo’ Legs” from Keep it Simple, and I knew the crowd in Boulder would get a big kick out of it. The song is basically about unconditional love, and how he would still love you even if you didn’t shave yo’ legs. The audience responded in cheers and a lot of support especially from the women. After three of his more classic tunes, “Life is Beautiful”, “More Than One Way Home”, “Suitcase”, Keb’ dedicated the next song to all of the lovers in the audience. He recommended that everyone hold hands, dance, and enjoy life together. This is a brand new song called “The Old Me Better.” It reminisces about the times where he would sleep all day and party all night. This was the part of the evening where the tunes got a little raw and down and dirty. “Soon as I Get Paid”, “Muddy Water”, “The Whole Enchilada”, “Dangerous Mood”, “Whole Nutha’ Thang”, and “Am I Wrong?” closed out the short, but sweet set. After the end of that set about sugar, fun, and sin, the encore was “A Better Man,” from his Slow Down album. It’s always good to come full circle or go on an adventure in a show. Song selection should be intentional, whether it is planned or spontaneous. Mo’ thanked Boulder and the local radio station KBCO for playing his blues. That was something that Buddy Guy remarked at his show about radio stations not doing enough of…playing the blues. But, KBCO is well rounded enough to give love where love should be given. Finally, he said, “I’m going home tomorrow, where I don’t have to talk,” as he played his final song of the night, “City Boy.” Although the show was over at 9:45, I felt complete. It is nice to hear a professional and a legend in a genre that helped pave the way for rock n’ roll, but is often forgotten about in the modern era of electronics. Let’s hope there are more artists that are influenced by these throwback geniuses, and look out for Keb’ Mo’s new record in a month.